The Premier League have announced that VAR will be used in the top flight for the first time next season as they look to eradicate refereeing mistakes from the game. However, some of the best, funniest and most iconic Premier League moments have come from mistakes in the game and the game of football would be a far duller place without these moments. We take a look back at some of the best. Yes. One of the funniest moments from the Premier League came as Chelsea ran riot against Arsenal and the Gunners crumbled to pieces. Arsene Wenger was coming under fire from the Arsenal fans on his 1000th game in charge but Jose Mourinho’s Chelsea showed no mercy on the day. The talking point of the game occured with the Blues 2-0 up early on, Eden Hazard fired a shot towards goal which was saved on the line by Alex Oxlade-Chamberlain and for some reason Andre Marriner showed Kieran Gibbs a red card. This is despite Ox telling the referee it was him on multiple occasions. We would never have got this gem of a moment VAR was in place back in 2014 and one of the great talking points would have been instantly dismissed. Watch the nightmare below. One of the fiercest games of football anywhere in the world in the early 2000’s was between Arsenal and Manchester United. The two top clubs in England at the time had teams stacked with fierce characters and of course there was the small matter of Patrick Vieira v Roy Keane. Keown gave away a penalty, Ruud stepped up and smashed the ball against the crossbar leading to absolute chaos. 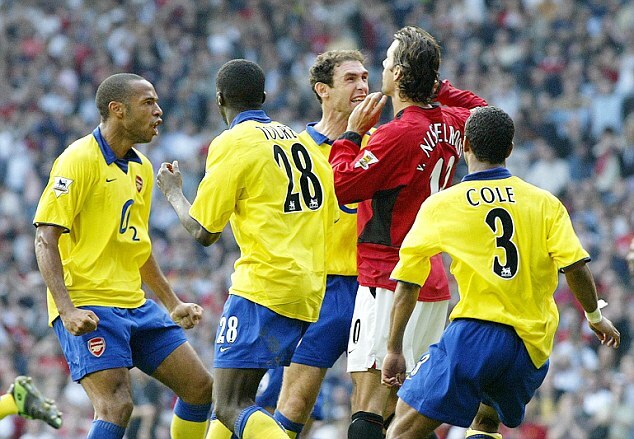 Martin Keown jumped up and down in the Dutchman’s face whilst the other Arsenal players shoved him around. An outstanding Premier League moment which led to no yellow or red cards being shown. No doubt VAR would have lead to a pause in play and ten-minute wait for the penalty and then a red card for Keown. Luis Suarez was one of the Premier League’s top strikers but he was also a very naughty boy who could not resist a cheeky nibble. Branislav Ivanovic was his first victim all those years ago when he unleashed those rodent like canines into his delicious flesh. 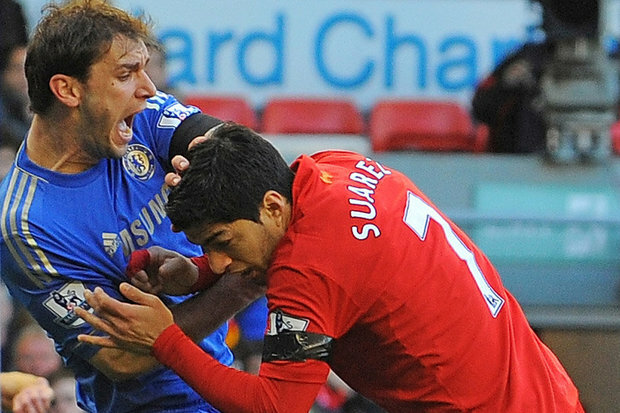 Ivanovic protested and showed the referee who was having none of it whilst Suarez seemed to claim Ivanovic’s arm had fallen into his teeth. An interesting tactic from the Uruguayan amazingly paid off as he was not sent off at the time, and then went on to controversially bag a stoppage time equaliser. Absolute scenes that would not have been possible with VAR. We don’t want to see this sort of shithousery wiped out from the game. What a stunning goal this was. A real joy to behold. Man Utd were cruising against a woeful Sunderland team when Henrikh Mkhitaryan pulled off one of the most spectacular goals we had seen in the Premier League, until Olivier Giroud bettered it a few weeks later. This goal was still something to enjoy though and even though it was offside I really didn’t care. A wonderful piece of skill and technique. With VAR in place this would have just been another disallowed goal but instead we got to enjoy this beauty!